Waterproofing membranes are essential to any construction project, regardless of scale, type, or location. Ensuring their proper specification and installation is absolutely necessary to meet energy and environmental outcomes and ensure the long-term integrity of the finished project. In spite of being a critical mechanism for a building's success, the importance of such membranes is often understated, or worse, misunderstood. The reality is that waterproofing is far more complex than just a simple membrane, and as such, there is a pressing demand to carefully specify waterproofing systems that have been tailored to meet the specific demands of each and every project. Done properly, waterproofing does not have to be solely a preventative measure but can be an active benefit, as an investment in securing long-term energy efficiency and the meeting of environmental goals. In this whitepaper, we take a closer look at waterproofing systems and explore how they can be optimised with these outcomes in mind. Waterproofing is generally installed behind the outermost layer of construction (be that the façade, roof, or flooring) to prevent water ingress into the building, although they can also be used to protect other components such as planter boxes, podium slabs or decks. Complete waterproofing systems are supplied as a series of components - only one of which is the waterproof membrane - forming a watertight layer that completely seals the area of installation. Complete waterproofing systems utilise a membrane in addition to any necessary ancillary components manufactured specifically by any one company. These ancillary components include proprietary solutions designed to ensure they can successfully complete all aspects of the installation, such as specific steel profiles, cast-in reglets etc, which should not be substituted with pieces from another system. The failure of waterproofing membranes due to human error in the installation or wear and tear over time poses a potentially catastrophic problem. Many of the symptoms associated with water ingress and retention - such as mould and mildew growth or structural damage - only become visible after the worst damage has already been done. This makes the correct installation of a high-quality waterproofing system all the more valuable for long-term building integrity. "Complete waterproofing systems are supplied as a series of components - only one of which is the waterproof membrane - forming a watertight layer that completely seals the area of installation." A well-designed waterproofing system can do more than act as a passive barrier to water ingress: it can also facilitate the use of environmentally beneficial solutions such as green roofs by ensuring that they work as designed and without fault. Green roofs are an effective mechanism for mitigating Urban Heat Island Transfer, a natural phenomenon observed in densely built-up urban environments whereby the large amounts of impermeable surfaces present retain and release more heat than their less dense, suburban counterparts. 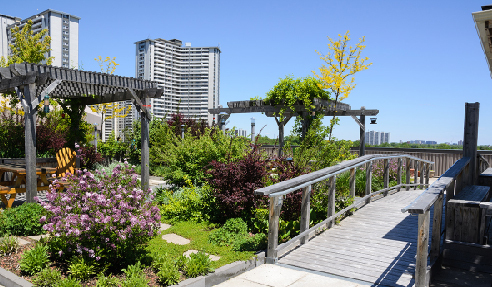 Green roofs reduce heat gain through evapotranspiration: a green roof (and the surrounding air) can be cooler than the measured air temperature on a hot day, whereas a conventional rooftop can be up to 50°C warmer. The inclusion of a green roof can help reduce both the unnaturally high temperatures experienced in dense urban living and the energy requirements associated with artificial heating and cooling for that respective building.2 Green roofs additionally serve as a natural filter for air pollutants and greenhouse emissions through carbon sequestration. 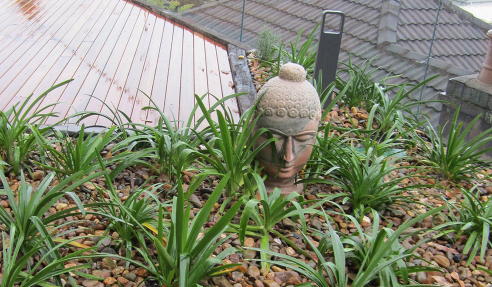 The benefits of green roofs are such that in 2014, Sydney launched Australia's first 'Green Roofs and Walls Policy' to increase understanding and use of green roofs across the city. 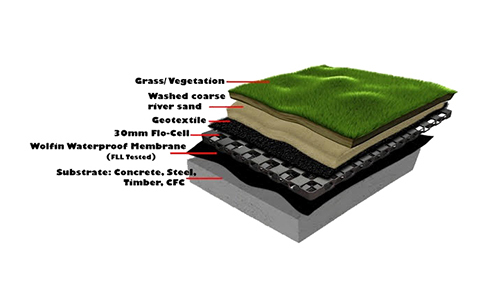 However, in order to reap these benefits, a green roof must be paired with a comprehensive waterproofing system. A high quality, properly installed waterproofing system will prevent the leakage of soil and moisture into the building, resist root growth and puncturing, and help the soil retain moisture, facilitating healthy plant growth. Furthermore, a green roof can even help extend the lifespan of the roof, minimising the natural wear and tear that would otherwise be experienced. Proper waterproofing provides valuable protection against condensation and climatic conditions, both of which are major causes of building damage and potential health hazards. Providing defence against water ingress is particularly crucial in Australia, where the Bureau of Meteorology has predicted that the number of extreme rain events will only increase as the climate heats up.5 Built up condensation leads to high relative humidity, which in turn may cause a number of adverse side effects. One such side effect is the proliferation of dust mites, which is particularly problematic considering that the National Asthma Council of Australia has reported that 45 per cent of Australians suffers from allergies. Of this figure, about 80 per cent are allergic to dust mites. Dangerous microbial infestations such as fungi, mould, mildew and bacteria also become more likely in high humidity environments, aggravating asthma and allergies and potentially leading to more adverse symptoms should the root causes remain untreated or unseen. Proper waterproofing can prevent the build-up of condensation, in turn reducing the need for alternative measures such as mechanical ventilation, extractor fans, or dehumidifiers. Sealing the building against outdoor elements also enhances energy efficiency by minimising the requirements for AC and climate control; a practice exemplified in the third party energy efficiency standard Passive House. Specifying adequate waterproofing systems from the outset requires long-term planning ability, but as a payoff provides long-term protection of the built asset, and has multiple benefits for all stakeholders involved. Designers can be assured that the building is protected from premature damage and wear; occupants can enjoy improved comfort and building amenity, and building owners benefit from reduced running and repair costs. The latter point is particularly crucial, given that while waterproofing membranes amount to an estimated 2-3 per cent of total construction costs in residential buildings, 75-80 per cent of building defects are water-related. A total waterproofing system is an investment in the longevity and performance of a building that ultimately pays off: in addition to reducing energy bills, higher quality, fit for purpose specifications minimise the need for costly repairs and replacement. Manufactured in Germany since 1963 and introduced to the Australian market by Projex in the 1980s, the Wolfin Waterproofing System is the original Projex Group waterproofing solution. Warranted for both labour and materials (single point warranty), the Wolfin Waterproofing System has a demonstrable long life of over 30 years. Together with the Cosmofin Membrane System, it offers the best of German-manufactured waterproofing solutions, offering globally and locally proven long term protection against moisture and weather conditions in service temperatures ranging from -25°C to 85°C. The UV stable membranes exhibit excellent resistance to chemicals such as those present in fertilisers, and have both been FLL tested and certified root resistant, making them ideal for use in rooftop gardens and landscaped areas. By allowing water to collect safely, green roofs may flourish and operate as designed, without stakeholders having to concern themselves with the disturbance, removal and replacement of both gardens and failed membranes as a result of water ingress. They also feature excellent elongation properties, accommodating for building movement by allowing the waterproofing system to stretch - by up to 350 per cent among Wolfin membranes - without compromising their integrity. Both systems may be applied to the most common building substrates including concrete, timber, steel, CFC, masonry blockwork, etc, and are compatible with most new construction materials including lightweight hollow formworks. Wolfin and Cosmofin Membrane Systems can additionally be laid directly over failed waterproofing systems, including bitumen. Paired with their own comprehensive ancillary systems, featuring specially designed factory-bonded steel profiles, cast in reglets, pre-made corners and PVC welding solvent, both the Cosmofin and Wolfin Membrane Systems represent complete waterproofing systems in their own right. Specifying either system comes with backing by the Projex Group and full support and service with all installations, including design, specification, job specific detail drawings and technical on-site support. For more information, visit www.projex.com.au. "A total waterproofing system is an investment in the longevity and performance of a building that ultimately pays off." For over 25 years, Projex Group has led the Australian market in engineering and waterproofing products of unrivalled performance and quality. The Projex range of waterproofing membranes has adapted to growing demand for total waterproofing systems, and is designed and engineered to enhance buildings of all sizes and natures in all environments. Projex Group's genuine desire to protect buildings and structures from damage caused by moisture and the elements is paired with a strong focus on sustainable development and drive for outstanding customer service and support. The company has earned a reputation for delivering high quality, fit for purpose products for projects across all Australian sectors including healthcare, civic and industrial buildings, residential properties, transport infrastructure, and commercial structures. Each job is tailored to meet the specific requirements and complexities associated with that project. I would like to enquire about Projex Group.